My homemade refried beans recipe is simple to make and easy to freeze ahead for nights you don't have time to cook from scratch. Refried beans are not actually fried, they are mashed so they are much healthier than they sound. Using olive oil makes this a vegetarian recipe and makes sure you get some good fat into your diet. It's also gluten free, high in protein, cheap and filling. Pour the olive oil into a hot pan and add the onions to saute. Add the garlic just until gold brown and then add the drained beans and taco seasoning. Cook just until the bean are warmed through. Mash them in the pan with a fork or if you like them really creamy like I do pour them into a food processor and blend until smooth. Add more olive oil or add some water if you want them thinner. Add more taco seasoning to taste and any salt or pepper to finish them off. Serve hot in tacos, burritos, quesidallas or as a dip. Use any sort of beans you want, freshly cooked or canned. Instead of olive oil use lard or bacon grease. Leave out the onion and garlic or add more to suit your tastes. Some people like to melt in grated cheddar cheese. Add diced peppers when sauteing the onions and garlic. How to Freeze Mexican Refried Beans? Refried beans freeze great, they don't change in texture or flavor. Occasionally, if they're in the freezer for a long time they might become a bit dry but you can just mix in some water or olive oil to thin them out again. Let your homemade refried beans cool before freezing. 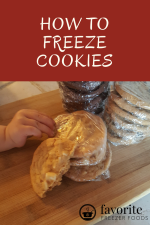 You can freeze them in a rigid container or a plastic freezer bag. Be sure to divide them into meal sized portions that work for your family. Label and date the bag and add it to your freezer inventory sheet. Beans can be thawed in the fridge overnight, under cold water in the sink or in the microwave. You can reheat them in the microwave or on the stovetop. 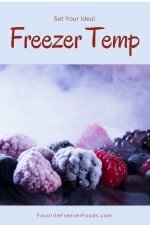 Learn more about frozen vegetables and try some new recipes. Return from Homemade Refried Beans Recipe to the homepage of Favorite Freezer Foods.